Trump Stamp Has Chicagoans Irked At The Donald : The Two-Way Against the backdrop of the city's historic architecture, Donald Trump is pasting his name in huge letters on the side of Chicago's Trump International Hotel and Tower. Chicagoans aren't annoyed by The Trump International Hotel and Tower so much as by the New Yorker who's having his name emblazoned on its side. Leave it to a wealthy New Yorker to raise the ire of the citizens of the Second City. And it's not because of something he said, or wrote, as a former New Yorker living here did last year. It's just five letters, the huge letters of this man's last name lit up for the entire Midwest to see: T-R-U-M-P.
Those five letters, more than 20 feet tall and 141 feet long, are being pasted to the most visible side of Chicago's Trump International Hotel and Tower. The location is about 200 feet above street level, on what by most accounts is an otherwise fairly tasteful skyscraper right between the historic Wrigley Building to the east, the iconic Mies Van Der Rohe IBM building to the west and other late 19th and early 20th century architectural gems (which make the Chicago Architecture Foundation's guided river tours a must-do when visiting here). And when it's finished, it will be all lit up to glow like a giant bug zapper along Chicago's stunning skyline. "It'll be like the Hollywood sign," Trump boasted to Chicago Tribune architecture critic Blair Kamin. "Just for the record," renowned architect Adrian Smith, who designed Chicago's Trump Tower, tells Kamin, "I had nothing to do with this sign!" "It's an atrocity," said 35-year-old Zack Tiknis. "I read somewhere that they said it was graffiti. I don't even think it's graffiti, it's just a man who already needed to over-compensate, over-compensating even more. He's got a bloated personality and this is our visual proof." 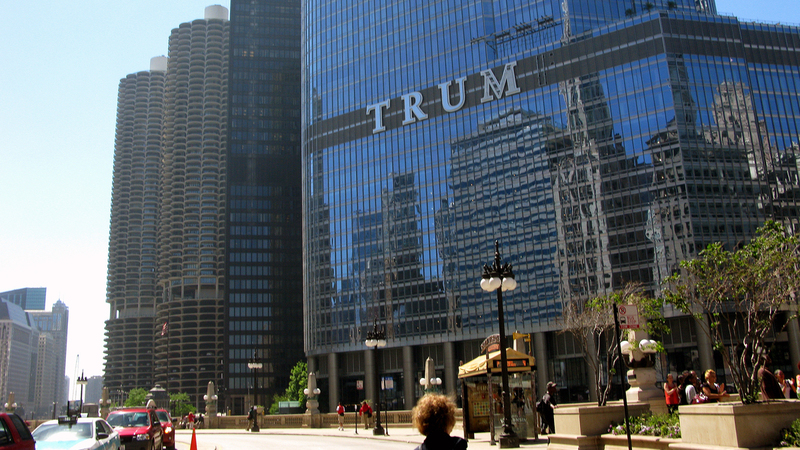 Other Chicagoans out for a stroll along the river, Wacker Drive or over the Michigan Avenue Bridge, gasp out loud when seeing the still incomplete "TRUM" in such large letters. "It's hideous!" I overhear one woman say while the friend she's walking with covers her mouth with one hand and points with the other, as if witnessing a horrific accident unfold before her eyes. "How did the city even let him do that?" questions another. Well, Trump actually wanted his name in lights to be much, much bigger. A spokesman for the city's planning department says he originally proposed that his name cover more than 3,600 square feet. The city trimmed it down to about 2,800 square feet. "Donald Trump is everything that isn't Chicago," said Chicago Sun-Times columnist Neil Steinberg on WBEZ's The Afternoon Shift on Friday. "He's this sort of glitzy, vacant, New York rich guy, and it's grotesque to see him there." "It's the size, too," adds Chicago Tribune columnist Eric Zorn on the same program. "It's this incredible monument to him ... and people are aghast at that sign." One of the reasons many Chicagoans find the big bold Trump sign so offensive could be because despite expectations, the Trump Tower itself has blended in quite nicely and has even become an asset to the iconic Chicago skyline. "No one expected refinement like this from the Prince of Glitz," writes Kamin in the Tribune. "People formed a kinship with the skyscraper, which helps explain why they now feel betrayed." "We have one of the cleanest, sharpest looking skylines in the United States and he's gotta go and do something like this? This isn't Times Square," says the loquacious Westsider Tiknis, as he walked alongside the Chicago River opposite the Trump Tower on his way to catch the train to a late afternoon Cubs game. "I was thinking of a way to use like a guerrilla-like attack on it," adding that he wants to "figure out a way to white-out the 'T' so it just says 'RUMP.' "